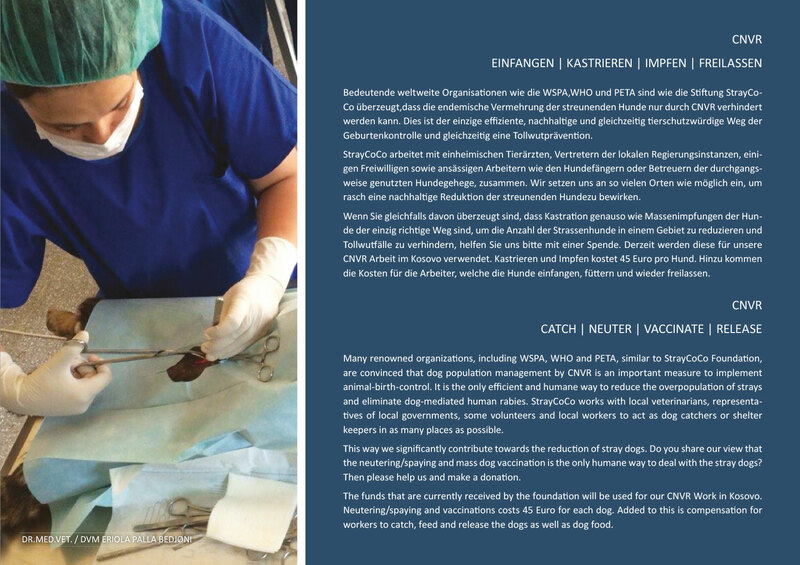 Many renowned organisations, including WSPA, WHO and PETA, similar to StrayCoCo Foundation, are convinced that dog population management by CNVR is an important measure to implement animal-birth-control. It is the only efficient and humane way to reduce the overpopulation of strays and eliminate dog-mediated human rabies. StrayCoCo works with local veterinarians, representatives of local governments, some volunteers and local workers to act as dog catchers or shelter keepers in as many places as possible. This way we significantly contribute towards the reduction of stray dogs. In autumn 2016 the government of Kosovo planed a new regulation to euthanise all stray dogs. We started to protest and our lobbying together with locals had success. The government has finally decided to start a CNVR program end of February 2018 and the parliament contributes with 1.3 Mio. Euro. In Practice this program has started in June 2018 - and as most of the veterinarians contracted by the state have no knowledge at all in dog treatment, and do not release the dogs in their territory, this program is doomed to failure! Do you share our view that the neutering/spaying and mass dog vaccination is the only humane way to deal with the stray dogs? Then please help us and make a donation. The funds that are currently received by the foundation will be used for our CNVR Work in Albania and to vaccinate/sterilise owned dogs of poor people in Kosovo. In Kosovo your donation will be as well used for emergency help and chipping owned dogs and registering dog owners - another model for the countries in the South Balkan. More information about how we are working and why, see study: How Holland became free of stray dogs.